The question of the night: why was D.J. Carrasco pitching for the Mets in the 8th inning of a one-run game? In case you missed it, D.J. 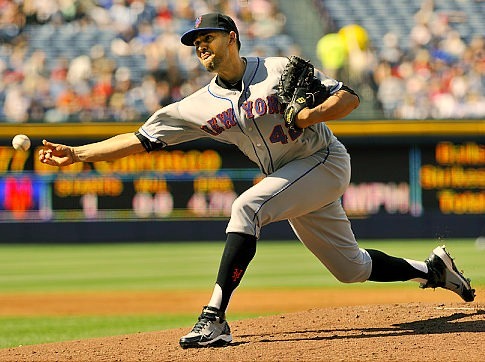 Carrasco is back with the Mets after some injury issues and a short stint in AAA. I’m sure you are pleased upon hearing this news. The great mystery, of course, is what angle — or angles — will we see Carrasco pitch from? Is it going to be overhand, sidearm, or submarine? All three? Will any of them be effective? Maybe he has figured out a way to propel the baseball from out of his belly button, which may be no more effective but may be neat to watch (though, I’m not sure whether the rule book allows it). Who knows, maybe he’ll do a Luis Tiant-like turnaround windup and twist so far that he throws the ball with his left hand; certainly, it’s worth a try. What say you? Are you excited that Carrasco is back on the 25-man roster? Anyone want to place a bet on his arm angle? (Please, no bets accepted by anyone who saw him throw in Buffalo.) What role, exactly, will he fill? Mop up? Seventh inning setup? Spot starter? Post your bets and theories in the comments. With 8 days until pitchers and Molinas report, the #8 question to be answered during spring training is: what arm angle will D.J. Carrasco throw from, and will he pitch well enough to make the 25-man roster? On the bright side, at least the Mets didn’t lose on 9/11; it was long after midnight, and already 9/12, when the final out was recorded. “Six in a row to make it go” is an old gear head / car enthusiast term referring to an inline six-cylinder engine. Perhaps it is also Terry Collins’ new mantra for getting his team going — six losses to get them moving toward a win? Or something. I’m trying here.